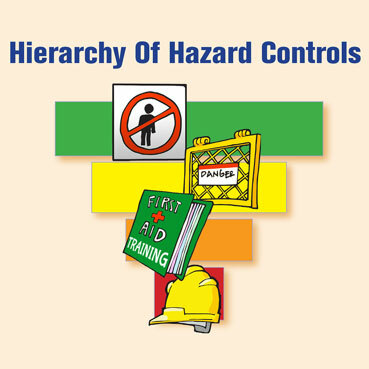 When attempting to eliminate dangers in a facility, it is best to look at each situation and consider the hierarchy of hazards, also commonly called the hierarchy of hazard controls. This hierarchy provides insight into the methods for minimizing danger in a specific situation so that it is possible to take the best action to keep people safe. Eliminate the Hazard - The ideal way to address a hazard is to eliminate it. If there is a piece of equipment that represents a danger to employees or the facility, consider getting rid of it. If that particular item is not necessary, it should be removed completely. Of course, it is not always possible to completely eliminate a hazard. Reduce the Hazard - The next best option is to substitute the hazard out with something less dangerous. If a fire hazard exists that can combust at 110 degrees Fahrenheit, for example, and it's possible to replace it with something that combusts at 250 degrees, the hazard can be dramatically reduced. While there is still a hazard, the facility and employees are much safer. Engineering Controls - Taking steps to control the hazard is the third best option. Take the above example of a combustible material. It may be impossible to eliminate the use of that material or replace it with something less combustible. If that's the case, it may be possible to build a fire containment room around the area where this material is used. This way, if there is a fire, it is confined to one area and the rest of the facility will be safe. Administrative Controls - The next option is to use administrative controls. These are essentially rules and regulations put in place to minimize the risk. When working with combustible materials, an administrative control might be prohibiting smoking in the area. Another good administrative control is to ensure all welding is done at least 100 feet away from areas where the combustible material is in use. While the risk is still present, administrative controls help reduce the chances that a dangerous incident will occur. Personal Protective Equipment - Finally, requiring employees to use personal protective equipment (PPE) is the last option in the hierarchy of hazards. When a hazard exists and other options can't completely mitigate the danger, PPE can protect employees if/when a dangerous situation arises. 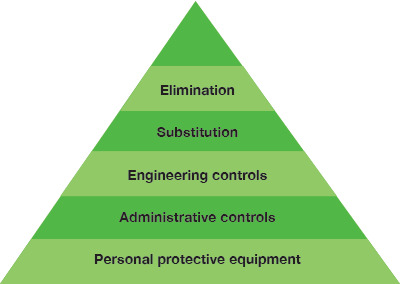 The hierarchy of hazard controls is used throughout all types of industries, and OSHA recommends it as an important safety improvement step. 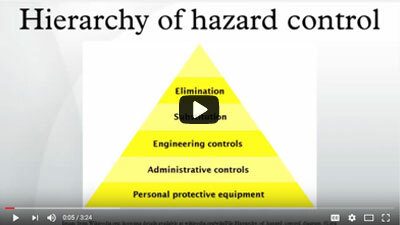 This video provides an overview of the parts of the hierarchy of hazard controls. While these hazard controls are listed in a hierarchy, it should not be assumed that only one of them could be applied in a given situation. If a facility is unable to completely eliminate the hazard, it is often a good idea to use multiple other hazard controls to keep people as safe as possible. For example, where combustible materials are used, a facility may be able to switch to a less combustible version of the material (reduce the hazard) and also require that it is only used in a safe room (engineering controls). The facility could further be protected by using an industrial label printer to create safety signs warning people not to bring any heat source into the room (administrative control). And finally, any employee working in the area may be required to wear personal protective equipment. In this case, four of the five steps in the hierarchy of hazards are used to keep the facility safe. By applying each of these steps properly, the facility will be far safer than if only one of them were used. Determining which of the hazard controls should be used in which situations can be difficult, but a facility should work to weigh out the benefits, hazards, costs, and other factors before making a final decision. The hierarchy of hazards is almost always pictured as a triangle or a pyramid. Whenever applying this methodology, it is essential to start at the top of the triangle (elimination) and work downward. As mentioned above, the higher up on the list, the more effective it will be. This system is sometimes pictured with the small point at the top because elimination is the most desirable solution, but also typically works in the fewest situations. Most hazards can't be entirely eliminated (or they would have been already). The workplace is, by its nature, somewhat hazardous. Working downward, the portion of the triangle gets bigger because it can be applied to a greater number of situations. At the bottom is the largest segment, personal protective equipment, which can be helpful in almost every hazardous situation. Other times the triangle is presented upside-down, with the top being the largest (elimination) because it is the most effective. Each option on the triangle gets progressively smaller as the effectiveness is also reduced. It is essential to remember, though, that even at the lowest level (PPE), the importance of using hazard controls should never be discounted. Before implementing any part of hierarchy of hazard controls, it is important to determine the risks present in a given situation. A job hazards analysis (JHA) is an excellent strategy for identifying risks and will help determine which steps in the hierarchy of hazards will be most effective. It is important that a job hazard analysis is done by a team of people that includes those who are most familiar with the actual job in question. Typically, this will be two or three front-line employees, one supervisor, and a safety manager. Unsafe Shortcuts - Front-line employees will be aware of what people are doing to get around safety requirements. Being aware of common shortcuts will make it possible to make adjustments to prevent those shortcuts and make processes safer. Improper Equipment - Having the wrong equipment for a job can make it much more dangerous. Using a hammer to do the job of a screwdriver, for example, will result in a less secure fastening. Lack of Awareness - If there is a hazard that could take employees by surprise, this should always be addressed. For example, if there is a ledge that is difficult to see when approaching, this is a major hazard that needs to be resolved. 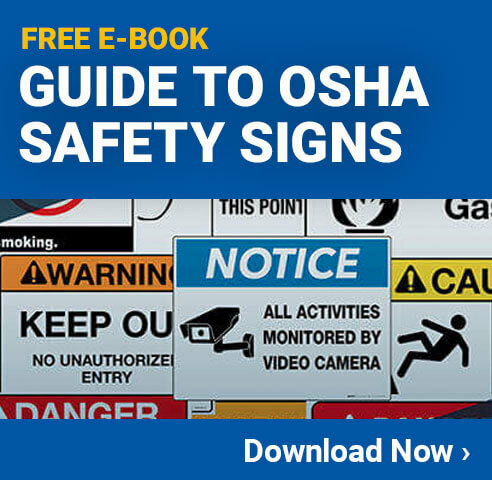 There are many other types of hazards in a facility that should be accounted for. Each facility is going to have a unique set of hazards, so it's important to take the time to perform JHAs and identify all risks. Observe the Job - Breaking the job into small steps is a great strategy. Identify specific steps that are performed so that risks can be identified. Identify Potential Hazards - Identify any hazards that can be found in any of a job's steps. Assess the Severity of the Hazard - Rating each hazard based on severity is important. If a hazard is present, but the only risk is that someone might get a papercut, the facility won't likely want to invest a massive amount of time or money into a solution. If the hazard is exposure to a cancer-causing chemical, it is essential to take major safety steps. Assess the Probability of it Occurring - Similar to assessing the severity, assessing the probability of something dangerous occurring is also important. Problems that have a 1 in 100 million chance may not need as close of scrutiny as something that has a 1 in 10 chance of occurring, for example. Rate Each Hazard - Putting hazards in the order of importance is essential. This is done by taking the severity of the hazard and the probability of it occurring and rating them together. A serious hazard that has a high probability of happening is the most important to address. Lower risks and lower probabilities are assigned to each subsequent hazard. Finally, once this information is collected, it is time to make recommendations for each hazard using the hierarchy of hazards. It is best to make initial recommendations right after the job hazard analysis is completed. This is when the specific hazards and surrounding activities will be fresh in the team's mind. Just because a particular solution is proposed first doesn't always mean that it will be implemented. Writing down proposed solutions from the hierarchy of hazards is a good first step in determining the proper response to a given hazard and will serve as a starting point for making decisions in the future. 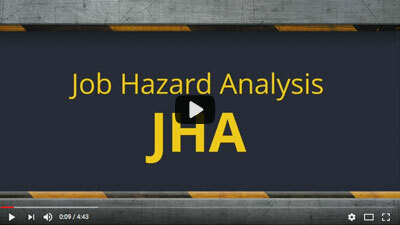 Learn about the job hazard analysis process in this video. Whenever identifying hazards or working to implement hazard controls, it is important to ensure everyone knows their roles and responsibilities. This will prevent miscommunications and facilitate open communication between employees and management. Role of Management - Management is responsible for making sure jobs are designed to be safe. This includes ensuring the right machines, tools, equipment, and other items are in place and available to the employees. Management should also make sure the right processes and procedures are in place for the employees to follow. Any personal protective equipment must always be provided, free of charge, to employees. Role of Employees - Employees need to be on board with following the hierarchy of hazard controls, too. They need to make sure they are using all the equipment and tools in the way they were designed. By going around safety steps, for example, employees put themselves at risk. Employees should also know they are responsible for reporting any new hazards they discover. This should trigger a job hazard analysis with the management team so the risks can be evaluated and addressed. Another benefit of the hierarchy of hazards is that it is recognizable in companies around the world. Even where it might be called something else, just about every safety system has a hierarchy of options for hazard mitigation and an order in which these options should be implemented. As employees come or go from a facility, they should already be familiar with this concept and why it is effective. While it is still important to provide training to all new employees about this concept, most people will already be aware of it, at least in theory. Even new employees to an industry will likely be able to catch on to this system very quickly because it is simple and logical. It doesn't require any advanced knowledge of other industry strategies or philosophies, though it is often included as part of other risk management or safety improvement systems. Even if a business already uses a process of safety improvement, it is important to have something formalized, like the hierarchy of hazard controls. This will ensure each situation is reviewed properly and the right solutions are put in place to get the best possible results.